drop even lower fish kills are possible. Oxygen is not only ingested by fish but also bacteria which are the major decomposers of the system. Thus if too many nutrients are present from over fertilizing of the water, either from runoff of synthetic fertilizers or animals, bacteria proliferate when algal blooms take advantage of these abundant nutrient resources. The algae grow rapidly and abundantly but when their life expectancy of around 14 days happens chaos ensues as they die and then are consumed by bacteria. This is what happens every year at the mouth of almost every major river but is famous in the delta of the Mississippi River and its creation of the Gulf Dead zone. There a region the size of New jersey measured 13,080 square kilometers (= 5,052 square miles) has no life after the initial flush of agricultural nutrients because of the overload that comes from runoff from the vast corn and soy region. The algae and plankton thrive immediately from the excess nutrients but their overgrowth then leads to conditions with no oxygen as the bacteria consume and respire. Thus in our aquaculture system we must temper fertility with oxygen levels. Another determining factor of oxygen present is temperature. 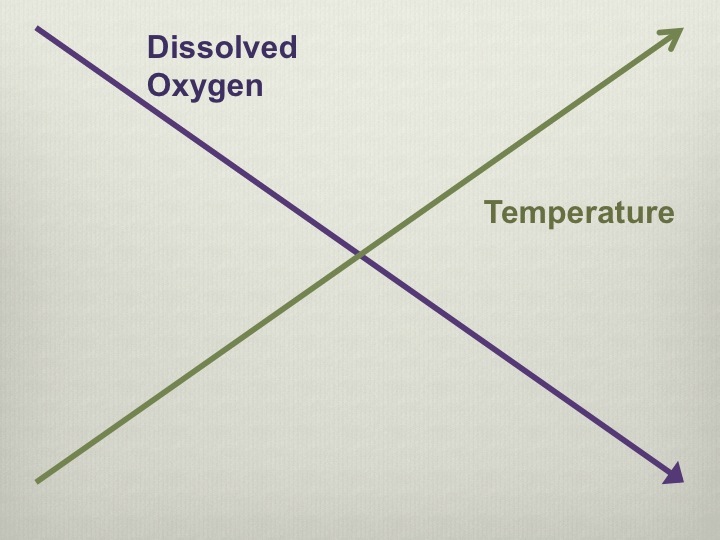 Temperature and oxygen have an inverse relationship in water bodies. That means that as temperature goes up less oxygen is available and vice versa. In natural aquatic systems you see this with fish like trout, from cold water bodies and streams, as they demand high amounts of oxygen while Tilapia demand very little. Tilapia evolved essentially in puddles in Africa with very low inherent oxygen levels as the temperature of the water resembles bath water. This is also why Tilapia are cultured so widely while trout have very specific ecological niches where they are cultured. Our design of systems help to create correct temperatures and supplemental addition of oxygen is often necessary for intensive aquaculture systems. Thus to culture trout, flow through systems, spring water is redirected into a series of ponds most often. However tilapia are raised in shallow ponds or tanks where the temperature can be raised more easily. Tilapia are tropical fish that have a short growing season to eating size so some sites have elected to do season extension like in the harsh climate of the northeast USA with greenhouses over ponds and tanks. In essence we must meet the fishes ecological niches with our design and augment fertility, temperature, and oxygen levels to fit appropriately. are filter feeders as they are low on the food chain so we aim to have as much algae production possible as the adults feed on this protein rich source while the young feed on zooplankton which feed off the algae. They are able to convert this archaic plant material with their stomach pH of 2.5 and their evolution over the years to adapt to the harsh climate in tropical Africa. So I began to mix EM (effective microorganisms) with guava fruit (a sugar resource) and chicken manure (nitrogen and phosphorous resource) in a 20 L (5 Gallon) bucket and let that ferment for a couple of days and dump that into the pond. This would cause the water to become a deeper green which signaled algae blooms due to the phosphorous rich chicken manure. I would measure the change of color and fertilize again when the water became more translucent. As said above the device comes from a 20 L (5 Gallon) bucket lid which is easy to obtain just about anywhere. From there you drill a hole in the center and on the bottom fix a lead weight and pull a strong and lasting rope through. You tie a knot at the bottom with the lead weight creating an object that can be thrown like a lasso and that will sink in the water. The rope then has lines drawn on it for your given measurement system through graduations in cm or inches. The rope then becomes a measuring device of depth as the lid drops into the water. To help create visual accuracy, contrast is created by painting the lid black and white as seen below. Once the device is constructed, one stands at the bank of the water body and throws the device far enough into the water that it can easily sink and not hit the bottom too quickly. However if it is thrown too far away measuring through the graduations on the rope is made more difficult. When you throw the device, which should be done several times for an accurate reading, you look carefully both at the rope and the lid to see where in the water column it disappears. 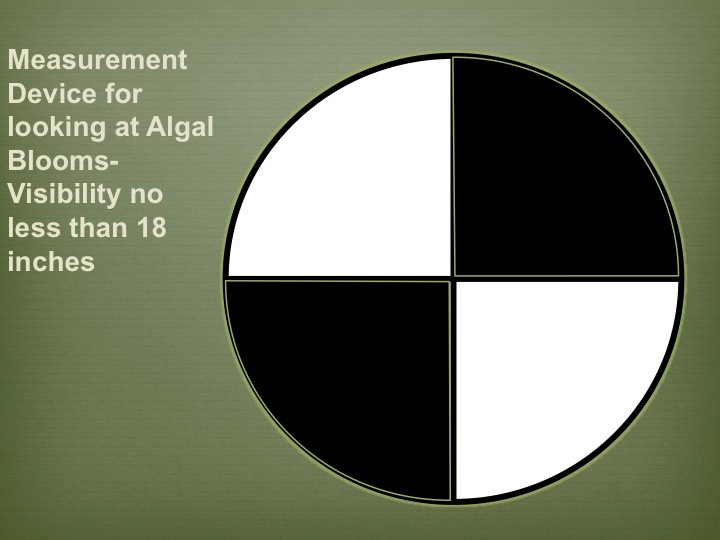 This lets you know how much algae is growing and the magic number is 18 inches or 46 cm. If the lid disappears before 18 inches, then the water has been over fertilized and oxygen levels will begin to decrease. However it is more than 18 inches the water does not have enough fertility and is due for a fertilizing that is done most often with manures. If you use this device nearly everyday your eye becomes trained to see this just as a soil scientist grabs a handful of soil and examines tilth and content. Aeration can be used to increase nutrient cycling and fish feeding at their peak rate. In commercial operations this is most often done through fountains or bottom bubblers that are powered by electricity which create tiny air bubbles and water surface tension breaking. The bottom aerator has the advantage that it destratifies the water as in larger water bodies the water forms layers of temperature; lake stratification. This helps to circulate the colder water at the bottom which of course has a higher oxygen level. Use of appropriate technology can take us off the grid electricity which is often coming from a polluting energy source such as coal. One can purchase a solar pump that has no batteries, which is the most ecological form of solar power, but then it doesn’t run in the night when oxygen inputs are low as each plant and algae in the water body add oxygen through photosynthesis when the sun is shining. So often a battery is truly needed when oxygen demand is low during the warmer months of the growing season. Thus a solar array with batteries can be purchased to power a solar air pump. Commercial bought ones are most likely more expensive than if you just bought the separate parts and assembled it yourself. Another option, but again is usually more of a day time input, is a windmill that powers an air pump. As the blades moves it powers the pump directly with no batteries and forces oxygen into the bottom parts of ponds. They can be expensive as well bought new commercially but there is the option of finding a local welder and assembling your own if possible. Furthermore, while doing research for my initial Tilapia job in Costa Rica I went back to Hocking Technical College where I graduated with a technical degree in Fish and Wildlife Management. I also studied aquaculture there and my old professor Lloyd Wright was happy to receive me on the day where the Malaysian Prawn Harvest was happening. I asked him about this tropical aquaculture and he told me of a U.N. assignment that he did in the 70’s in southeast Asia where fish culture was thought to be impossible. However he managed and the oxygen input for their extensive fish culture was people on transformed bicycles into paddle-wheels riding 24 hours a day in shifts. While sounding extreme biking on water for eight hours isn’t a bad gig if your protein and caloric input is not being met. Another way to improve water quality and oxygen is to diminish sediment in runoff into the aquaculture pond. If doing cultivation in tanks this is not a problem but ponds that are in valleys which accept runoff are often laden with sediments. This clouds the water and drops oxygen content. A silt trap just above the pond in the valley lessens that and should be apart of your initial design or retrofit. It’s a simple hole in the ground where the water first hits before reaching the dam and drops out the majority of the coarse sediment. It should be cited in a way that one can remove the sediment as it fills up by hand or with a digger. The silt trap is scaled up and down based on the catchment area above and the type of land use. More disturbed sites and bigger catchment areas of course create bigger silt traps. By creating varying depths in a pond, water will circulate based off of temperature difference. This is a very passive measure and will have little but some effect. Shallower parts will become heated more rapidly and the deeper parts will have a colder water regime. However stratification may occur with deeper bodies thus reducing this affect. Here is where the volume of the earthwork needs to be tempered especially if trying to grow warm water species. Another part of this is that if varying depths are created through in-pond terraces then several ecological niches will be achieved. The more plants in the pond means more filtration of nutrients and oxygen insertion. If the edges are well-developed extra fertilization may need to take place to assure the quantity of algae is present that one desires. Remember that the submergent plant category is the most beneficial at putting oxygen into the water body because its stoma are not in contact with the atmosphere thus releasing more. However some growers see these as nuisance as their dense forest like or kelp like growth can create a tangly mess. Management of this layer will definitely be needed. Another way to cool the water and filter nutrients is to build or buy floating rafts that mimic the chinampa systems of the Aztecs in the lakes of Mexico. These were built with water reeds and pond bottom muck until they were fastened to posts and became stationary island. They can be built to simply float and move around the pond with the wind and water currents. In modern-day they are built from recycled plastic most often with huge amounts of edge and buoyancy as they look like huge air filters for machines. This creates habitat for bacteria which filter in huge quantities along with plant roots from the plants that are inserted above. I view it as an appropriate technology and can provide shade and nutrient cycling especially in those waterways overloaded by nutrient runoff.